There will be a live-stream of tracks 1-5 on Sept. 5th and 6th. Find more details on how to become an RChain validator. Focusing on the performance demo & launch ceremony. Team & Medha are very focused on performance & stability. Worked on the project timeline & release criteria; roadmap will be updated. Bugs resolution is the highest priority. 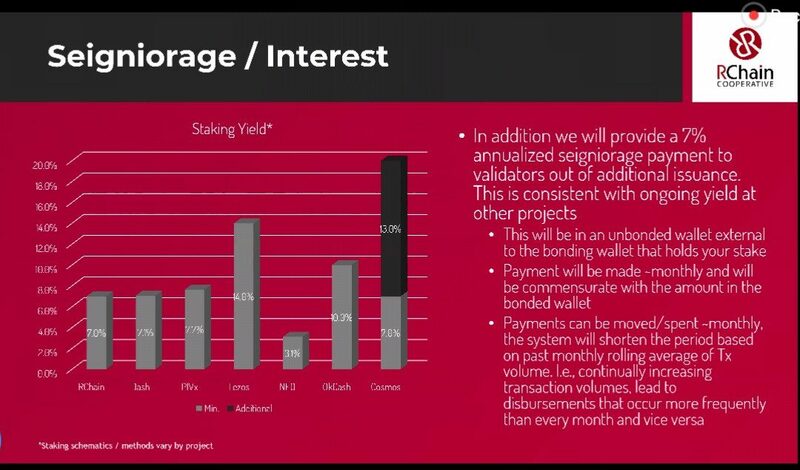 Economics for consensus will be part of RNode 0.7; sharding is planned for RNode 0.8. The team will end up delivering features all the way up through November, and probably fixing bugs through December. Worked with the development team, Co-op and stakeholders to settle on the release criteria. Great progress during node testing this week. We had 108 peers connected, 65 attendees on the call. Medha is focusing on Triage every Tuesday after node testing. If you come across a bug and want to file it, please check that no one else has reported the issue: Dashboard. Please provide your RNode version number + Git Hash, server logs, local blockchain and as much detail about steps to reproduce. We are also observing that the dev network is building a nice blockchain. Last week we observed over 40 blocks on the chain. Registry back end is in review. Working on the user interface. Genesis block signing metric and dashboard created. Genesis block signing tested with community members, works nicely. We will continue to work with validators during the private days in Berlin. Implementing 64 bit integers in Rholang – this is coming from the REV issuance script, the amounts are listed in Wei (dust). Tested the REV issuance & compatibility with ETH addresses. We have created a new wallet that will provide users. Several fixes to address race conditions in consensus that affected network stability. Fixes have been verified. Continue to profile RSpace & Node relating to thread management and performance. Investigated hybrid InMemory solution. This did not deliver the performance boost we hoped. gRPC stream errors caused by issue with Netty. There is an open PR with Netty that will resolve the issue in RChain. The RChain and Netty teams are collaborating. Validated the Grafana dashboard works with external nodes – to support testnet launch & performance test. gRPC Client API for client data retrieval in review. Node team focused on bug fixes and improvements to console messaging. Close to 30 community members will help launch test net at RCon3. They are working with the dev team and in Tuesday community testing sessions to prepare. The validator sale is ongoing. All of the sale documents will be posted in github. If you have applied, you should have already heard from us. If not please contact us immediately at staking@rchain.coop. Mrinal Manohar has prepared a very detailed financial model for the validator program. The entire team from Reflective will be at RCon3 so please look them up if you are there. The team is hosting a business lounge in the venue for meetings. If you have anyone that would like to meet with us, please email rebecca@reflectiveventure.io to schedule such meetings. Mrinal and Steve will be traveling to Asia for several conferences after Berlin, mid-September. We will be in Seoul from the 14th -18th, Singapore for Consensus 19th-20th, and Hong Kong afterwards. If you are in the area, please look us up. Trusted Key: the market for decentralized identity in the near term is with industry ecosystems. Trusted Key continues to gain traction within the healthcare and financial services sector with its focus on industry consortia and ecosystems. NHISAC and a number of its members are now working with Trusted Key to develop a solution that could benefit 150M healthcare users in the US. Trusted Key has also Blockchain Advertising Platform | Ethereum Blockchain Protocol | Lucidity with EY and Accenture and is working on multiple opportunities including with some of the country’s largest banks and automobile insurance providers. NH-ISAC is a trusted community of critical infrastructure owners and operators within the Health Care and Public Health sector (HPH). The community is primarily focused on sharing timely, actionable, and relevant information with each other including intelligence on threats, incidents, and vulnerabilities that can include data such as indicators of compromise, tactics, techniques, and procedures (TTPs) of threat actors, advice and best practices, mitigation strategies, and other valuable material. Sharing can occur via machine to machine or human to human. Lucidity: First set of pilots yielding strong results: 1) insights that lead to 10%+ savings, and 2) invalid impressions in certain foreign markets as high as 30%. Launched Singapore Airline and Yuengling campaigns last week. Will be at ETHIS, Wanxiang Blockchain Lab, DMEXCO and Consensus Asia next month. Mrinal Manohar explains the validator economics.